Freshman Republican US Senator Tom Cotton of Arkansas has set off a firestorm this week. He has written a letter to the the Iranian government and convinced 46 of his fellow senators to sign it. The letter reminds Iranian leadership that Barack Obama's unilateral attempts to negotiate with them do not carry quite the power that the US executive would like them to believe. This has many liberals screaming in rage, and some conservatives fist-bumping. Lew Rockwell is not impressed. I'm with Rockwell and the liberals in that any attempt to slap down a peace agreement is inherently a bad thing -- and Iran has proven through its history that despite autocratic rule it is probably the least aggressive nation in the Middle East. But I also understand the need to curb executive overreach when it happens. If Cotton had pulled this Rand Paul - type stunt on an issue that Rand Paul might have pulled it on (drones, etc. ), I'd be applauding. Regardless of our views on him, the neoconservative-backed Cotton has put himself on the map, and the associated astrology is interesting. Also, now that freshman senators with no qualifications other than charisma and big-money backing can ascend to the American throne, it may be a good idea to watch any critters on the Hill matching that description. In this case, the lack of a birth time makes it hard to see why Cotton is a regime Right-winger instead of a regime Left-winger. I suspect a time of birth would make it more clear. Libertarian: Pallas square Sun and parallel Mercury. The factors are very strong in both directions, suggesting one who might initiate or accept great evil in the name of doing a great good. One might argue that the Iran letter was such a case, weighing the good of curbing executive power versus the evil of blocking a peace treaty. Liberal: Moon in Aries (ruled by Mars which is trine Neptune) or in Pisces (ruled by Neptune). Venus-Mars/Saturn/Neptune Grand Trine: suggesting, perhaps, someone with an easy knack for working his dreams into solid reality. Jupiter/Saturn/Pluto aspect triangle: public authority and power? 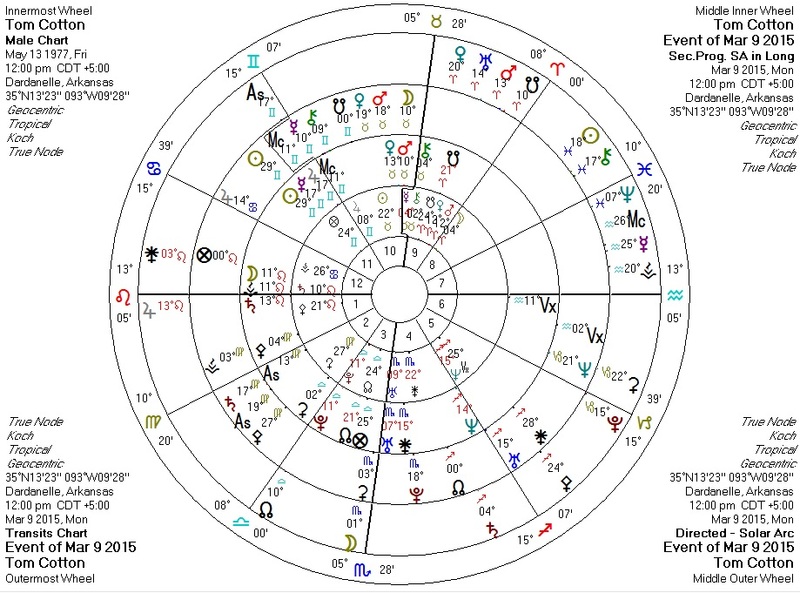 Uranus opposite Mercury, square Saturn, quincunx Jupiter: a public disruptor of authority through speech? Potential Bloodbath Formula, depending on birth time. It does not bode well that Cotton's first truly public act was to disrupt a peace negotiation. Mars return, conjunct Uranus and square Pluto: vigor and action combined with powerful disruption. Transiting Uranus-Pluto square, square/opposite solar arc Jupiter: exploding unto the public sphere. Transiting Saturn square progressed Pallas: adding difficulty to the peace process. Transiting Jupiter conjunct progressed Saturn (midpoint of Jupiter and Pluto): the expansion of personal power. Jupiter is retrograde and will return: Cotton ain't done with us yet. 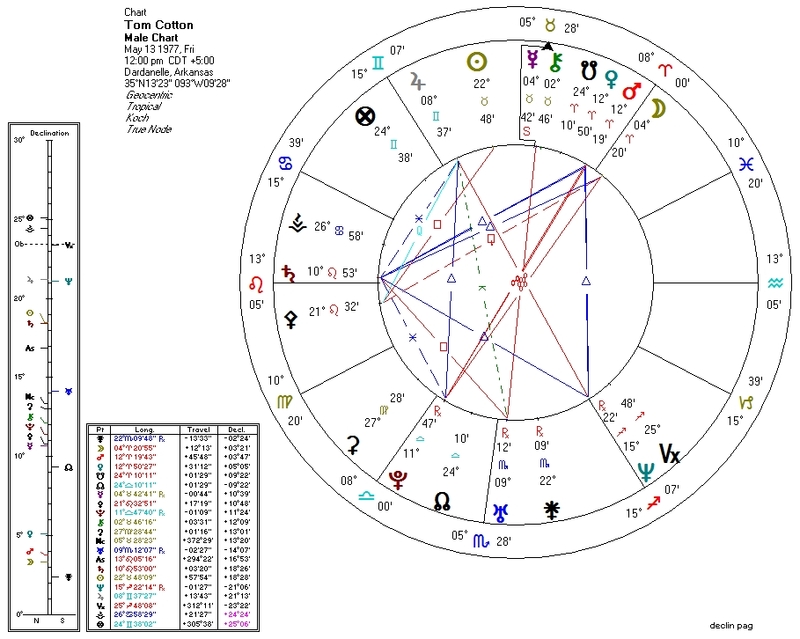 Transiting Mercury opposite Cotton Pallas, trine Cotton North Node, and sextile transiting Pallas: speaking in a way that involves ethics and reflects his personal destiny. Progressed Mercury and Jupiter conjunct: words exploding into the public sphere. Solar arc Uranus conjunct Cotton Neptune: mystique erupts. If this is the worst of the last hit of the Uranus-Pluto square (triggered by Mars), we might consider ourselves lucky.